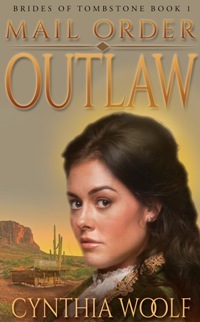 INTRODUCING…Mail Order Outlaw Heroine, Elizabeth Cobb. Elizabeth Cobb but they call me Lizzie. My best friend is Sally. She and I don’t get together very often. When we were kids we liked to play with our rag dolls or ride our horses. As adults, we barely get to see each other except when I go into the Tombstone Mercantile which she owns. My mother is Atina, she’s an Apache and very proud of it. She is wonderful and I love her very much. My baby brother is Jamie, he just turned eleven. I’m working the ranch until he grows up and can take it over. It’s his inheritance. Scars! Lots of them. You don’t get to be twenty-four years old on a ranch without earning lots of scars. I usually just go to my room and cry. Sometimes I’ll ride way out on the desert and scream up a storm, but I try to never lose my temper in public. First I don’t cook. Second, what is a refrigerator? My ranch. I know it’s Jamie’s but it’s mine, too. My heart is here. Mal Brandon, my fiancé, you’ll meet him in the book. He can always make me laugh with his antics. Especially when he was learning how to run a ranch. It was funny watching such a greenhorn. But he did everything, never balked at learning. He’s good that way. Yeah, I’ve had my heart broken. Who hasn’t. Mal was the one who broke my heart. Only those you love have the ability to hurt you that way and usually they don’t mean to. It just happens. I never thought I’d be able to have a husband and family of my own because I’m a half-breed. I’m proud of it. I love my mother very much, but in this country being half Apache is a detriment to getting what you want. BE SURE TO COME BACK to read more about Cynthia, her release, and an excerpt from MAIL ORDER OUTLAW on Wednesday’s Karen’s Killer Book Bench. Happy Reading! Why won’t you and Jamie share the ranch? After all you are running it /keeping it working til he’s old enough to take over…. see none of my business. Can’t wait to find out about your book. I suppose Jamie and I could share. He doesn’t really want the ranch anyway, but he’s the boy and he’s the one who inherits. Jamie is interested in astronomy and reading science fiction books. Of course, all that could change, after all he’s only eleven. I would love to win the book, if I do I would do a review on 2 or 3 places. That would be awfully nice of you to post reviews if you win. Why don’t you email me at cindy@cynthiawoolf.com. Perhaps we can work something out that will benefit us both. Thanks very much for having me back, Karen. I always have a good time on your blog. Thanks for the interview. Do we get to meet any other characters thru interviews? I don’t have any other characters set up to interview, so the answer would be, no. Karen, I appreciate another great author interview. Cynthia, your book sounds great also! Thank you. I hope that you’ll like it. I’m glad you’re enjoying their visits. All the best with your book, Cynthia. Being half Indian is a problem. Back in those days, the marriage between your mother and father is illegal and they could have been hanged from the nearest tree over it! We think things have changed in the last 100-150 years, and then we pick up the newspaper. Fortunately most of us are horrified at what we read. I’ve got to grab this book. You always write such wonderful tales. Thanks for stopping by E. I know how tough it was for my parents. That was one of the reasons they lived in Tombstone, it was not much more than a stage stop on the way to Bisbee when they married. There wasn’t anyone to nay say them. Still, Cynthia chose to make it much easier for me, even though I still had a time of it. Plus she gave me Mal/Ed, who sees me for me and not the color of my skin.